kdev-python on Windows: try it! Don’t consider this a beta release or something. It’s just the current state of things. You can just run this installer, launch KDevelop, and it should all work. To get completion for the Python standard libary, you need to have a Python interpreter (e.g. from python.org) installed and in your PATH before you start KDevelop. The kdev-python debugger currently does not work (or actually it does work, but the toolbar to control it is missing *grin*). Also it’s probably all a bit slow, because I built some components in debug mode … I think. Note that KDevelop on windows still has a few quirks, and kdev-python on windows probably has a few extra quirks on its own, so don’t expect this to be too stable. 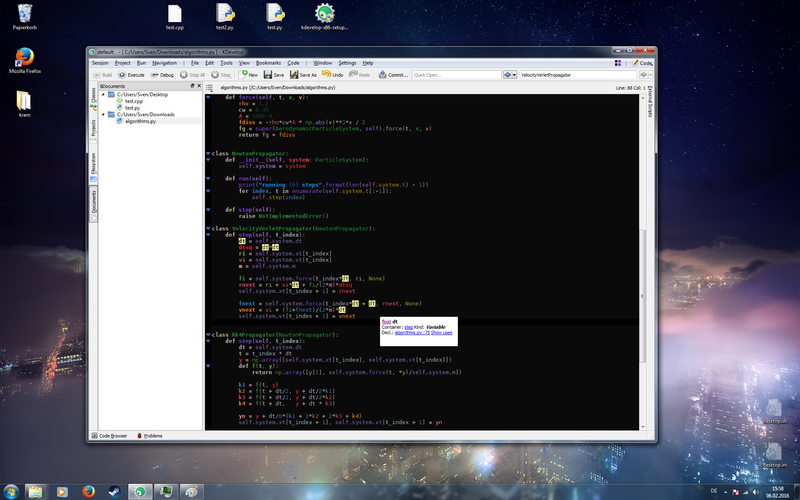 That said, I loaded large amounts of code into it and it didn’t crash and seemed to work just fine. Let me know if this works for you, or what problems you encounter. 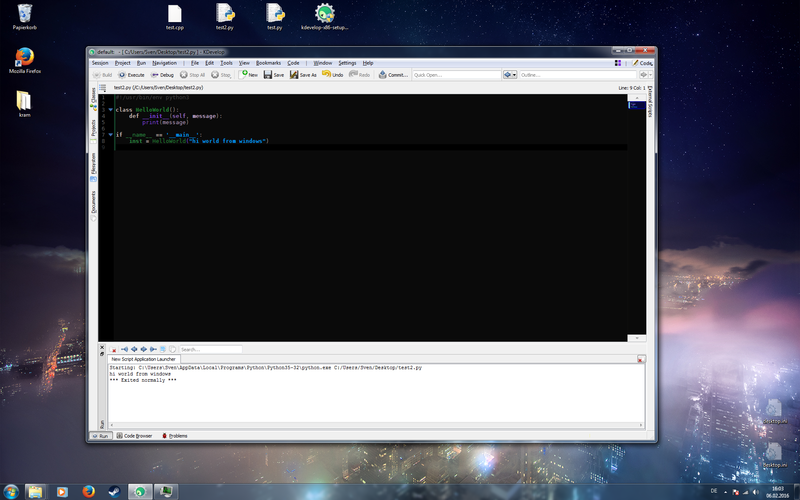 Kudos to Kevin Funk for doing lots of work on KDevelop on Windows and helping me set this up! 2. Works great so far ! 3. Any chance of getting an x86_64 version ? That being said, I now have a crash when starting kdevelop while it was working perfectly until a few days ago : it complains about ms-win32-file-l1.2.0.dll (more or less, I type this from linux). Is this something provided by the kdevelop installer, or is something wrong elsewhere on my system ? I’m looking for help setting up Kdev-python debug in Kdevelop 4.7.3 in Ubuntu GNOME. Google just gives NO answer. I apt-got the latest Kdevelop and the kdev-python package (I have only one in my repos), and I created a new python project, where I opened a py script of my own. I created a New Script Application Launcher and then pressed F9, but no luck, it says that “The current launch configuration does not support ‘debug’ mode”. Can you check under Help -> Loaded plugins whether the python debugger plugin is loaded? But no prob, I definitely found the forum on Google. “Python Debugger (pdb) Support” is listed in the Loaded modules… Any idea ? Or should I follow-up in the forums ? (I didn’t really touch anything there). The error is now different ! The Debug Section (with console output), simply says “Error: does not exist.” Nothing less, nothing more. Ah, yes. I fixed that in more recent versions; the “Run current file” is broken with the debug launch. You have to click “Always run the same file” and select your script by hand. Tah, only this… So sorry. It looks like it’s working now ! Is there any chance to run it on Windows XP (x86) ? Installation is ok, but won’t start . I’ve tried on real and virtual OS – not working. Is there support for XP ? What is debugger support status now? I don’t see the menu items (Step, Toggle breakpoint) on 5.0.3. Just read about Py support in KDev bout 48 hours ago and tried it out with a few stubs I was messing with and everything ran as expected. Tried a few “broken” stubs too and the debugging results were consistent so KDev is PyFriendly; all done in Windows 10 64bit Professional with the latest O.S. build –will try KDev out in all its glory after the Creator’s Update. 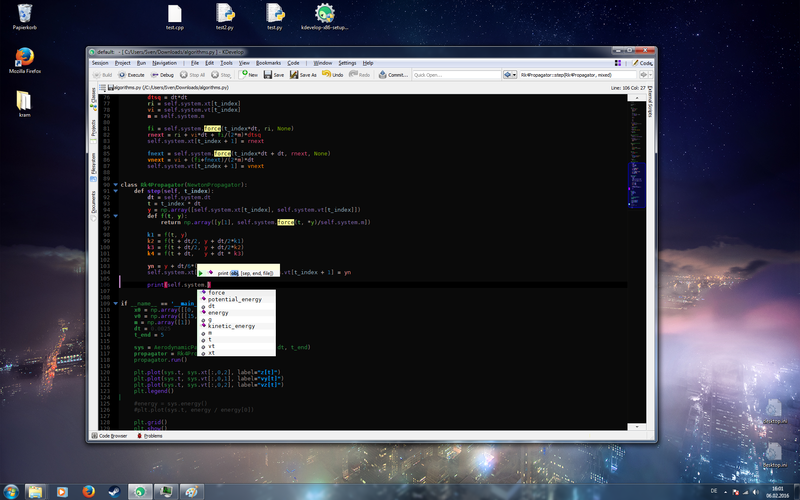 Am very pleased with KDev for Windows thus and have adopted it as my new PyIde. Code completion and squiggly, on-the-fly syntax checking is excellent already, so there you go! I likes it a lot!!! Cool, glad you like it! If you run into any problems on Windows, please let us know, we still don’t have a lot of real-world testing coverage there. Thanks for all the contents of your page. 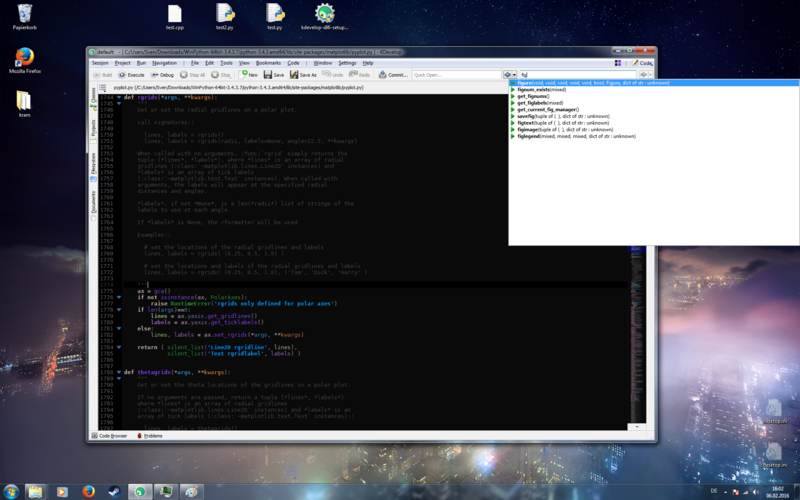 My goal is to have PYTHON V3 running in the environment. What would be the best way to install it. I downloaded the kdev-python-v1.7.3-py3.tar.xz file. What should i do now to include the PYTHON language. Nothing — the Python v3 language plugin is included in the Windows installer. It should just work. You only need to install Python 3 from python.org.